Matthew Anthony Estate Agency - News- Worthing Property Values 4.1% higher than year ago – What`s the PLAN to fix the Worthing Property Market? Worthing Property Values 4.1% higher than year ago – What"s the PLAN to fix the Worthing Property Market? It`s been nearly 18 months since Sajid Javid, the Tory Government`s Housing Minister published the White Paper `Fixing the Broken UK Housing Market`, meanwhile Worthing property values continue to rise at 4.1% (year on year for the council area) and the number of new homes being constructed locally bumps along at a snail`s pace, creating a potential perfect storm for those looking to buy and sell. The White Paper is important for the UK and Worthing because it will ensure we have long-term stability and longevity in the property market as whole. Worthing home-owners and Worthing landlords need to be aware of these issues in the report to ensure they don`t lose out and ensure the local housing market is fit for purpose. The White Paper wanted more homes to be built in the next couple of decades, so it might seem counter-intuitive for existing home-owners and landlords to encourage more homes to be built and a change in the direction of housing provision – as this would appear to have a negative effect on their own property. Yet the country needs a diversified and fluid property market to allow the economy as whole to grow and flourish ... which in turn will be a greater influence on whether prices go up or down in the long term. I am sure every homeowner or landlord in Worthing doesn`t want another housing crisis like we had in 1974, 1988 and most recently in 2008. Now, as Sajid Javid has moved on to the Home Secretary role, the 17th Housing Minister in 20 years (poisoned chalice or journeyman`s cabinet post) James Brokenshire has been given the task of making this White Paper come alive. The White Paper had a well-defined notion of what the issues were. For planning to work, we need a robust Planning Department. Looking at data from the Local Government`s Association, in Worthing, the council is below the regional average, only spending £23.99 per person for the Planning Authority, compared the regional average of £38.14 per head (see graph above) – which will mean the planning department will be hard pressed to meet those targets. 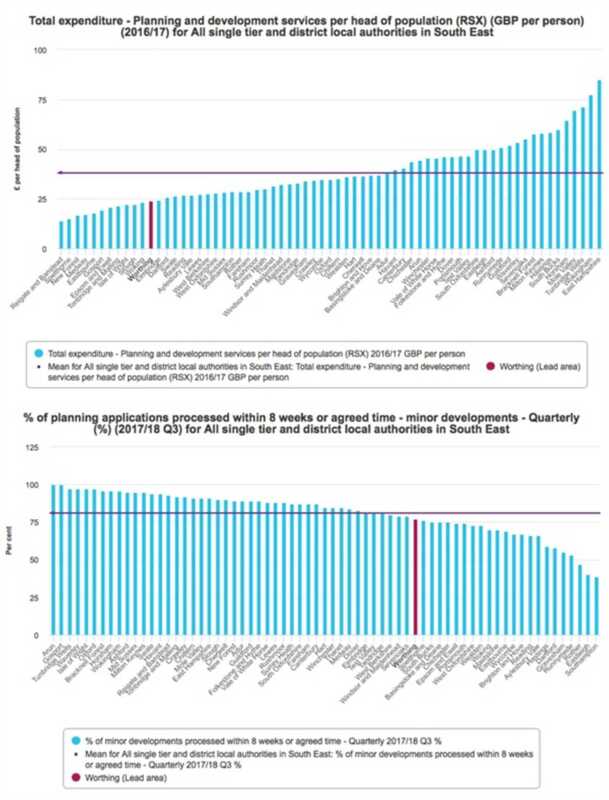 Also, 77% of planning applications are decided within the statutory 8-week initial period, below the regional average of 81% (see the graph above). I am slightly disappointed with the numbers for our local authority when it comes to the planning and the budget allowed by our Politician to this vital service. It won`t surprise you that 104,640 Worthing residents are living in the urban conurbations of the authority, giving a density of 32.2 people per hectare (much lower than I initially thought). I would agree with the Governments` ambition to make more efficient use of land and avoid building homes at low densities where there is a shortage of land for meeting identified housing needs, ensuring that the density and form of development reflect the character, accessibility and infrastructure. It`s all very good building lots of houses – but we need the infrastructure to go with it. Talking to a lot of residents in Worthing, their biggest fear of all this building is a lack of infrastructure for those extra houses (the extra roads, doctors surgeries, schools etc.). I know most Worthing homeowners and landlords want more homes to be built to house their family and friends, but irrespective of the density, it`s the infrastructure that goes with the housing that is just as important and this is where I think the White Paper failed to go as far as I feel it should have done.